When I first walked into Home I was doubly lost, like a blind man in the dark. I searched the navigator to see what this brave new world held for me; there was indeed a vast array of places to go, but the first one that really stood out and made my mind jump to attention was the LucasArts Creature Cantina. I admit I am a massive Star Wars fan. I love the series and have since its debut in 1977. Now I had the chance to walk the famed cavernous space that is the Mos Eisley Creature Cantina. The joyous thoughts of walking in this place rattled like coins in a clothes dryer and made this the first place I went when I arrived. You enter at a long, sand-colored hallway; this is a great spawn point. 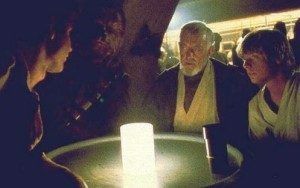 It gives one the feeling of having just walked in off the streets of the Tatooine city for a break and a drink. The walls are lined with pictures of the famed Star Wars characters in the promotion of the BluRay box set. As you round the hall, you find the entirety of the place in eyeshot, and what a sci-fi fan’s feast it is. To your right is a machine that is plastered to the wall with a blue light fixture in it. This is cool because this is right out of the movie. Watch your copy and you will see that it is there. On the left is a white C-3P0 head dismembered and adorning a sign that reads, as the movie states, “No Droids Allowed”. Then you enter the actual place. The first thing you see is a long curved bar with an NPC bartender. I can’t tell you how many times I have seen people stand there and ask for Jawa Juice like it’s code for something greater or more sinister. There have been a few times when I have seen people talk to the bartender as though it is a person. My tactics to save the new person the trouble is to either private-message them or walk up and joke on how I’ve been on a long time and he’s never even moved from that place. He is never going to respond, not in a million light years. Yes, supposedly there were times when someone from the dev team would bring the bartender to life and interact with the community, but I never saw it. So, yeah, I figure it spares them the rancor of those who will mock new arrivals still adorned in the familiar blue Home logo shirt. Although to be fair, I rarely have seen such venom fired at any particular group while in the Cantina. For the most part, people here tend to not be overly aggressive. I basically think that this is such a target-specific place that either you love the franchise and want to go to have fun, or you are one who does not care for it and would tend to stay away, save the trolls who go just to pester people. The bar is a long one — long enough to hold a good amount of people all adorned in various Star Wars or sci-fi attire. One side faces a set of dark alcoves; perhaps one of these is where Han Solo fired (first) on Greedo. This area is great because one can go and simply sit and chat with friends on what is the quieter side of the bar. There is a caution here for new people, though: in the last alcove, there is a set of red and blue lights on the wall. Many people who know the trick will try it on the new patrons. The ‘trick’ is this: they try to convince an unsuspecting person that running in between the red and blue lights will allow you to go outside the cantina or some fantastic promise like that. 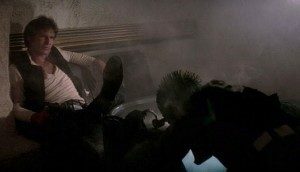 Truth is that the victim will simply get stuck between a chair and a table, forcing the victim to leave the Cantina and thus return. Not the worst thing that can happen, granted, but annoying and rude to new Home friends. Tucked into one corner is a commerce point. This is a very well thought-out commerce point because it is set into the décor as a separate alcove. Some places have obvious commerce points that are simply a floating blue shopping bag icon on a kiosk. This actually blends in quite well to its’ surroundings and is stocked with a good amount of LucasArts items from the Star Wars franchise as well as the Indiana Jones franchise and Monkey Island. Coming back around the bar, there is a large, dark room. It seems seedy until you realize that nobody really occupies that place. It has a large screen promoting the aforementioned Star Wars HD movies. The short video is entertaining for the first few times, but the zing quickly fades after a few rotations. I walk the place often and rarely see anyone there, but it has that darkness that seems right for those below the law to do their evil workings, like Sith Lords or bounty hunters. Figin D’an and the Modal Nodes. You know them, you love them and they play 24/7 just for you. 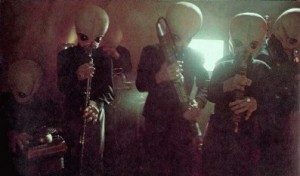 The Creature Cantina band. The iconic bubble-headed band that plays far out and wacky instruments from a long time ago in a galaxy far far away, playing for your enjoyment. They are NPCs, but excellent ones. They do what every band should do: play no matter what the people around them do. They play all the famous songs, and the dance floor in front of them — through small — seems to hold just enough people and make it feel crowded and happily active. Though it is now an older place in the frontier that is Home, it’s still a great place to hang out with friends and even find a few new ones that share the mutual love of all things sci-fi and fantasy. There are a few drawbacks to voice, but nothing that should keep anybody away. There is a curtain that doesn’t allow you entrance into a room that has been under construction for so long it seems that it will never be done, likely due to budget cutbacks or somesuch. There are no rewards here, and no games or activities to entertain you as Sodium has at its hub in the bartending game. Like any other place, the music gets repetitive after a while, but that’s ok when you sit and indulge in that ‘Jawa juice’ and watch the swarms of Stormtroopers and Boba Fetts standing around adding to a rich flavor that helps this virtual world become a little bit more real. In the end, all anybody can measure space by is whether or not you want to go there; whether or not you like it enough to hang out there and find the fun in it. I personally have it on my favorites list, and still, enjoy it. Business has slowed since the advent of the Hub, but there are always new people coming and going, and some people that are veterans there. Being void of games or activities, this space still stands out as a great destination to just hang out in and let the Force be with you. Enjoy that Jawa juice!